I provide modern interior design photography for a number of companies who trust me to liaise with their clients and to photograph real designs and work. It’s great work, not only do I get to photograph new design innovation but I also get to see new trends, materials being used and colours. On this occasion I was out with Anglia Kitchens and Bedrooms to photograph a newly installed kitchen prior to the client starting to utilise their new space. 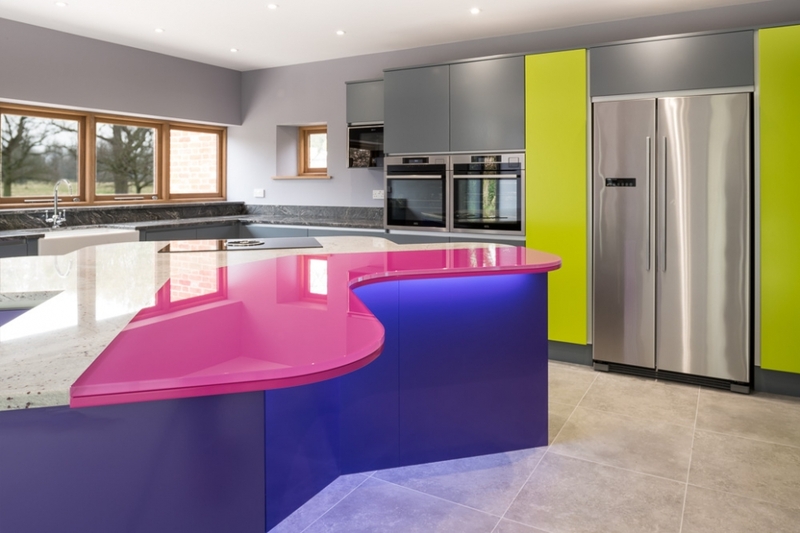 This was an amazing modern design with great space, vibrant colours and some high quality, beautiful materials all designed and installed by Anglia so check out the link above. 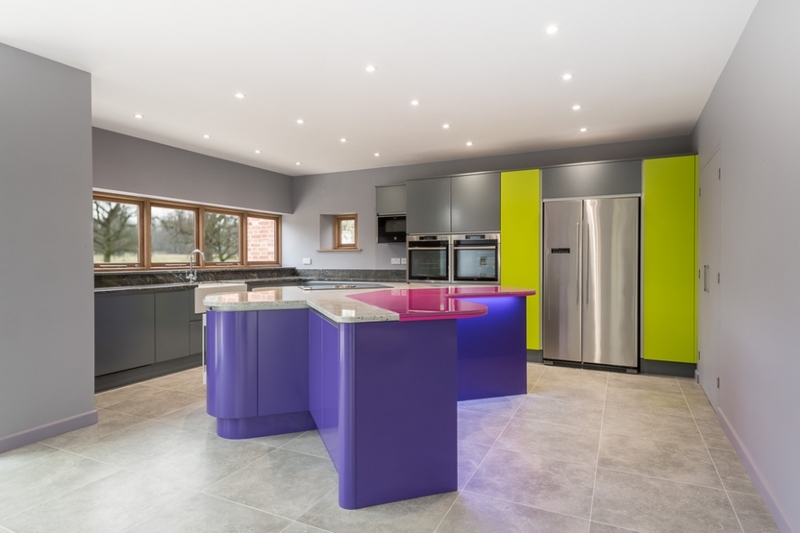 In photographing this kitchen which had some generous acreage of space I aimed to connect the colours and work stations associated with a kitchen from the sink, to the cookers and of course the fridge and storage spaces. I also wanted to highlight the architectural design with plenty of natural and reflected light from lovely bright floors and the windows and add this to the kitchens own lights which included a lovely accent light beneath the stunning pink breakfast bar area. 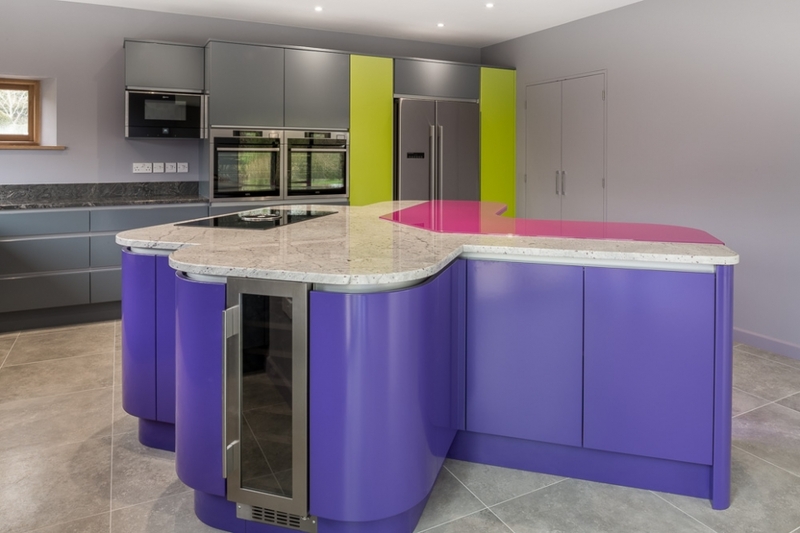 There were some lovely leading lines to work with in this kitchen and this added to the unusual shape of the island which housed an ultra modern hob, wine cabinet and more made for great compositions of the kitchen’s elements. Personally speaking I usually like muted colour schemes but with some of the recent kitchens I’ve photographed being anything but muted in their colour gamut I’m really starting to warm to the bold use of colour in modern designs, you can’t help but smile. If you have a kitchen or interior design company please get in touch so that I can talk through photography options with you.